-Layer half of the meat, half of the beans, and half of the corn on top of tortillas. Spread out evenly. -On top layer, you may want to garnish with sliced black olives or jalapenos. I always do! -Bake about 25 minutes or until cheese is all bubbly and a bit crispy around the edges. Plop some sour cream on it and enjoy, using some Scoops or other crunchy corn tortilla chips to help you clean your plate. YUM! *This can easily be made into a vegetarian meal by omitting the meat, adding more beans, and seasoning the beans with the taco seasoning or plain cumin. A new hobby I picked up last year was baking homemade bread. Now it started out as one of those things I just wanted to learn how to do… so, like everything, I researched it to death and figured out how to do it. After a few failed attempts, I perfected a delicious loaf and I have been obsessed ever since. I’ve now learned to bake several types of bread and I love them all, but here’s the recipe for the definitive crowd favorite: Honey Oat Soft Wheat. 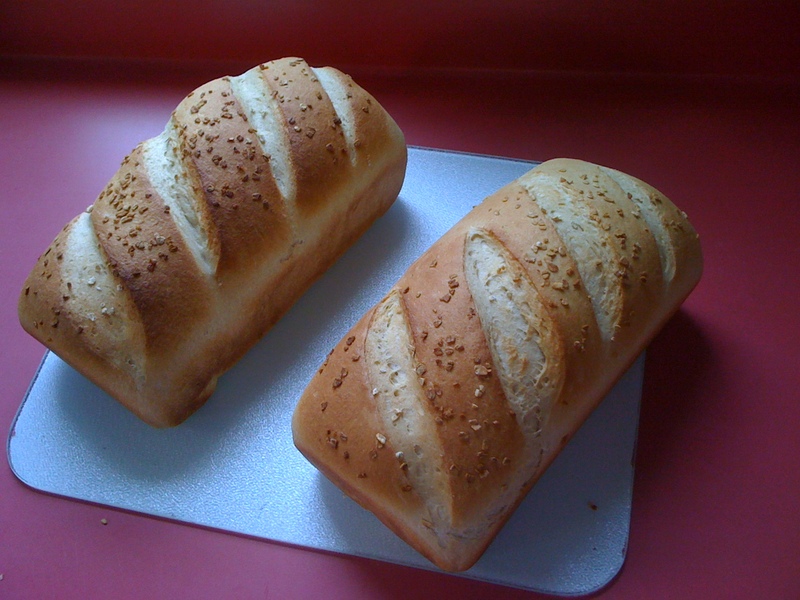 This recipe makes two standard loaves with about 16 slices each. Enjoy! Mix dry ingredients above in a large bowl with a stiff spoon. Add above wet ingredients and mix thoroughly. Use your hands to get all the ingredients mixed well together in the bowl. Dough will be warm and shaggy at first. Keep mixing until dough forms a loose ball and pulls away from the sides of the bowl. Flour a large flat surface (I use my counter top after it has been cleaned and dried well) and turn dough out onto the floured surface. Knead well for about 8 minutes. Let dough rest while you clean out the bowl you used to mix it in. Dry thoroughly, then put a few drops of canola oil into the bowl and spread around. Put dough into this bowl and turn a few times so all sides are coated with a light bit of oil. Cover bowl with plastic wrap and lay a towel on top. Place in a warm area (on top of the oven or kitchen table will do) and let rise for about 2 hours. Place each loaf of dough in a greased loaf pan and cover again with plastic wrap and a towel. Allow dough to rise for another hour or so, then it will be ready to bake. Remember, this bread has no artificial ingredients or preservatives (isn’t that awesome?!) so that means it does not have a long shelf life. But as delicious as it is, it probably wont stick around long anyway! I hope you like it as much as my family does!